﻿The Peggy Sue pattern includes an accordion-pleated skirt and a bonus dolman-sleeved top, both in two length options. The whole outfit is reminiscent of the 1950s, but accordion-pleating is a modern fashion staple too. So whatever your doll’s chosen fashion era, she will be perfectly attired in this cute skirt and top. The skirt has an elasticized waistline, so the fit is forgiving for most of the popular soft-bodied 18” dolls. It will easily fit a doll up to 12¾” hips. The accordion-style pleats are pressed and then edgestitched to keep the pleats permanently crisp and fresh. The skirt is designed for woven fabrics and the great news is that the shorter version of the skirt can be made from a Fat Quarter (18” x 22”) of fabric. The bonus dolman-sleeved top is bound to become one of your doll’s favorite items of clothing. It’s designed for knit fabrics and it is easy to wear and quick to sew. It has a center back closure, three quarter length sleeves, and a bound neckline. The back is fastened with hook and loop tape or snaps. This top is also Fat Quarter Friendly! For 1950s style outfits, the ensemble can be finished off with a wide ribbon or elastic belt. Instructions are included in the pattern for creating an elasticized belt from fold-over elastic and paracord clips, but if you have some ribbon and a buckle, then you’re all set to go it alone! I hope you enjoy sewing this outfit as much as I enjoyed designing it! Happy Sewing! What You Get: One 25 page sewing pattern that you digitally download as a PDF file so you can start your project immediately! The PDF sewing pattern provides full color step-by-step illustrated instructions and full size pattern pieces. This pattern includes a 4 page Summary of Instructions section so you can print out just the text version if desired to save on printer ink! A PDF reader is required to view and print the files (example: Adobe Reader or Preview for MAC). The download link is received immediately after the transaction is complete. Print copies are NOT available. Best Pattern Ever and Fun to Make! I was able to test this pattern and it has become my favorite, both for the adorable skirt and the easy top. The skirt has edge-stitched pleats that are very easy make, following Genine's excellent no-fail directions. I used a cotton poplin for the skirt, and the now-permanent pleats are absolutely crush proof! 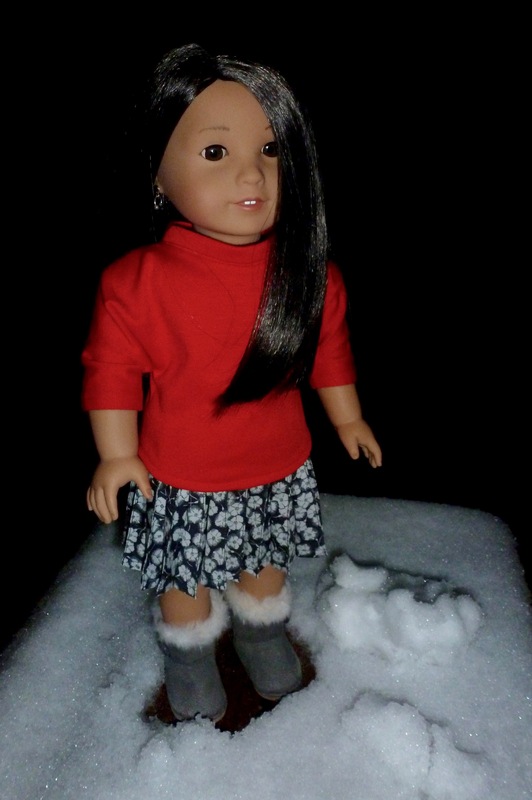 The top can be made of a variety of knits, makes up quickly, and fits a variety of dolls well. I have used a ponte knit and a repurposed tee shirt knit, both quite successfully. I would suggest basting on the neck band first, to make sure it is small enough to lay properly before being permanently stitched.